Bottom Line: A nice rustic food beer. Traditional bitter ales range from golden to copper in color and are around 3-3.5% in alcohol. They feature accents of hop aromas and, despite their name, are characterized by non-bitter, fruity flavors. Bitters originated as English specialties, though they are now widely-emulated in North America, sometimes with domestically-grown hops imparting a more assertive character than in traditional English takes on the style. Noteworthy examples of this style include: Coniston Bluebird Bitter, Adnams & Co. Broadside Ale, Young’s Bitter and Goose Island Honker’s Ale. 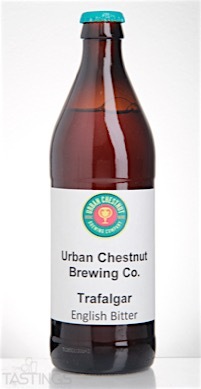 Urban Chestnut Brewing Company Trafalgar Bitter Ale rating was calculated by tastings.com to be 88 points out of 100 on 3/23/2016. Please note that MSRP may have changed since the date of our review.